If you don’t identify problems with your water heater and have them repaired promptly, they’ll become more severe. They might even escalate so much that you need to replace the water heater entirely. Watch for issues like inadequate hot water, strange noises or unpleasant smells. That way, you can repair your water heater before it breaks down for good. If you’re always running out of hot water, or if the water is lukewarm, you could have a broken thermostat. Your water heater might also have been poorly installed or too small to handle your household’s demands. A gas heater could have an obstructed flue or vent, and an electric heater could have malfunctioning heating elements. A professional can inspect your gas or electric water heater to diagnose the issue. Sediment that builds up in your water heater’s tank can cause a popping or rumbling noise. Over time, those minerals can also keep your water heater from filling up completely and cause it to run out sooner. The smaller volume of water will often boil and make a high-pitched whining or whistling sound. An expert should flush your tank to remove minerals. Otherwise, corrosion could cause leaks and water damage in your home. Bacteria in the sediment inside your water heater will die and decay over time. This can create a smell like rotten eggs every time you turn on your hot water. Your hot water could also look yellow, dirty or rust-colored. Most water heaters have an aluminum or magnesium anode rod that attracts minerals to prevent corrosion. However, it can become so corroded that it stops working, causing damage to the unit. 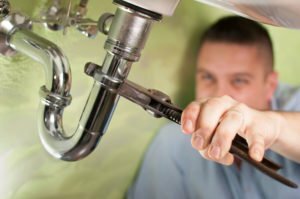 Air & Energy has more than 35 years of plumbing, HVAC, and electrical experience. We can help you with repairing or replacing your water heater, along with a variety of other equipment. Call us at 941-778-0773 for more information and excellent service from our friendly team of experts.